Number of cards in deck: 80. There two cards numbered 0 (zero), and one blank card. Back of card: Something like a royal blue with turquoise border. In the center, a sea-blue all-seeing eye. In the four quadrants, in gold, are a triangle, circle, square & crescent. The gold shapes ruin the symmetry but if you're not fussy, you can invert the cards. Book included: Yes, 296 pages, 6 x 9 inches, or 15.2 x 22.8 cm. Illustrated. Titled, The Compass Guide to the Quest Tarot, by Joseph Ernst Martin. Comments: On the back of the book it says that Joseph Ernest Martin has been a professional tarot card reader for more than ten years. Inside the book, it says he's been a professional tarot reader for more than 15 years (pgs ii & 295). He is also a lecturer, fine artist & award winning art director (back of book), or professional artist & art director with more than 63 design awards (pg ii). Or maybe all of the above. Imagine a Tarot deck that you could use like a Ouija board [Ick!] to get yes/no answers or spell out words. Imagine learning the traditional card meanings in a course of a card game with your friends. Imagine using the same cards to predict your future. Now here's something that doesn't require your imagination - the deck exists, and you're looking at it. Certainly can't fault the enthusiasm. This isn't tarot at all, of course, but it should be helpful if you find yourself reading for singles in a bar on Friday nights. To put this pop image in context, it helps to remember earlier Lovers cards. Originally a man was forced to choose between a young woman & an old crone (the Marseilles deck). A.E. Waite changed this to: The man wants the woman, but the woman is looking to god, above them both (Rider-Waite). (Waite used a nearly identical design for the Devil card, which few have noticed). Since then, the card has been degraded to: YOU WIN! You get a night with the girl (or guy) of your choice! In a century, the Lovers card has gone from resisting temptation to orgasmic release. But so has society in general. The rest of the deck rarely rises above this level, for better or worse. 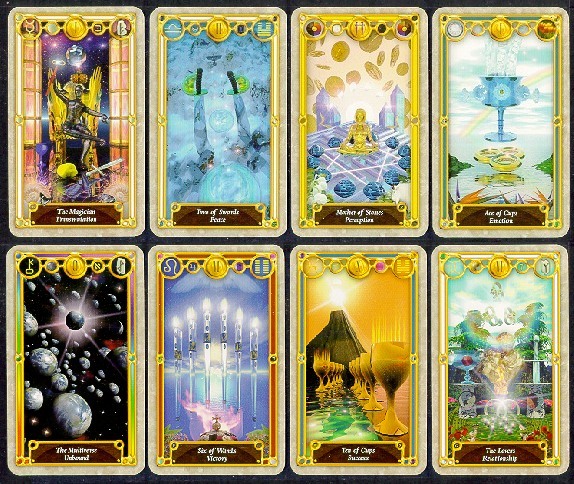 There are two cards marked 0 (zero): The Fool, and the Multiverse Unbound, which, in the original order of the cards, is placed after arcana 21, the Universe, which itself takes the place of the usual World card. The definitions are easy to guess: The World was enough for the 19th century, but in the 20th, we outgrew it, so the Universe. And now, in the 21st century, multiple universes too: The Multiverse. (Imagine. You not only get your choice of bed-partner, you get all known & unknown creation. Isn't life great?) The last card in the pack has the fancy border of the others, but is blank inside. This is just in case you have brainstorm of your own. And that's the full compliment of 80 cards, the most a printer will do without a lot of fuss.